A splendid day opened the 29th Andrea Margutti Trophy at the South Garda Karting Circuit in Lonato, as a record number of 252 drivers made it to the track for a high class challenge in qualifying held on Friday March 9th. A spring weather has made it up for the bad weather of the past few days, and the first racing day has been regular, which allowed all the drivers to show their best. Category KZ2 had 62 verified drivers at the start and the quickest of all was 2016 Trophy winner Giacomo Pollini, who topped Group 2 on Formula K-Tm-Vega in 45.803s. The best time of Group 1 was set by Simone Cunati (Top Kart-Parilla-Vega) in 46.027s, while Massimo Dante (Maranello-TRm-Vega) went quickest in Group 3 in 45.905s. In OK, category with 31 verified drivers, the quickest time was posted by by the German Hugo Sasse (KR-Parilla-Vega) in 46.378s, as he led the two fellow-countrymen Luca Maish (KR-Parilla-Vega), second in 46.473s and Paul Enders (CRG-Parilla-Vega), third in 46.634s. In OK-Junior, the Brazilian Gabriel Bortoleto (CRG-Tm-Vega) has been the quickest of the 46 drivers at the start in 47.993s, while the Dane Peterson Hojgaard (Kosmic-Vortex-Vega) topped the charts in Group 2 with a best lap of 48.041s. The other top positions went to the British driver Zak O’Sullivan (FA Kart-Vortex-Vega) in 48.071s and to the two CRG drivers Enzo Trulli (son of former F1 driver Jarno Trulli) in 48.135s and Alfio Spina in 48.118s. The smallest category, 60 Mini, counted 64 drivers on track. The Brit Coskun Irfan (Parolin-Tm-Vega) went quickest of all, while Hayden Lupifieri (CRG-Tm-Vega) was the fastest in Group 1 in 53.440s and Cristian Bertuca (Evokart-Tm-Vega) in Group 3 in 53.427s. Danny Carenini secured the pole position of the single-make Trophy Iame X30 Senior in 48.712s and he had the upper hand on the 32 rivals on track. Leonardo Caglioni was second in 48.730s, while last year’s winner Vittorio Maria Russo was third in 48.761s (all on Tony Kart-Iame-Komet). 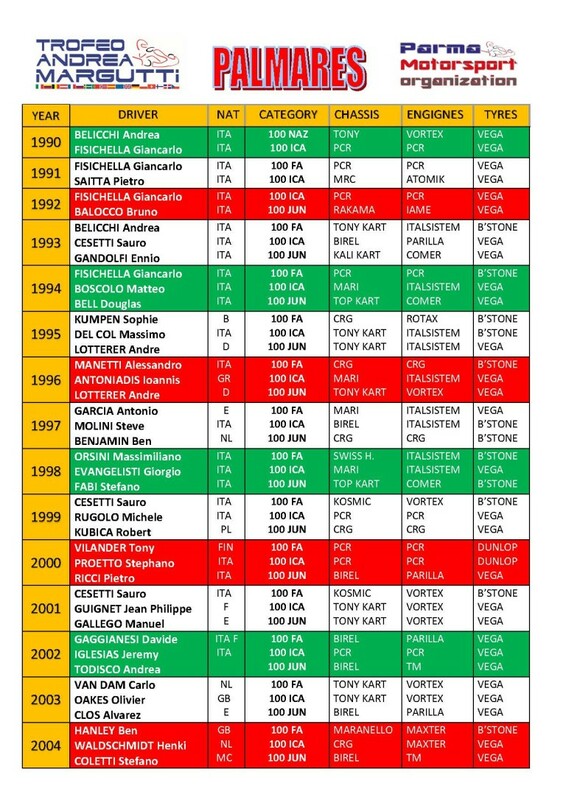 Qualifying heats will take place on Saturday March 10th, Second Chance Races, Prefinals and Finals will end the racing weekend on Sunday with live streaming feed available at www.trofeomargutti.com. Saturday March 10th: Warm-up from 8.30 to 10.24; Qualifying heats from 11.00 to 18.00. In the pictures: Giacomo Pollini, KZ2; Hugo Sasse, OK; Gabriel Bortoleto, OK-Junior; Coskun Irfan, 60 Mini; Danny Carenini, X30.